The Pacific War Online Encyclopedia: Wavell, Archibald P.
Wavell was born in a military family and was educated at Winchester before joining the Black Watch. He fought in the final stages of the Boer War and distinguished himself as a trainer of troops during the First World War, where he fought both on the Western Front, where he lost his left eye, and in the Middle East. In the early stages of the European war, he oversaw brilliant successes against the Italians from 1940 to early 1941. Though arguably one of the best generals in the British Army, many of his forces were diverted to the debacle in Greece, leading to reverses in the Western Desert that ended with his relief by Churchill in July 1941. Wavell was in command of the Indian Army at the beginning of the Pacific War. He would find himself once again heavily outnumbered and denied adequate reinforcements in Malaya, the Netherlands East Indies and Burma after the outbreak of the Pacific War. Promoted to field marshal and made an earl and Viceroy of India in 1943, he worked for a reconciliation with the Indian National Congress and found in William Slim a field commander capable of leading his troops to victory in Burma. His efforts to relieve the famine in Bengal in 1943 were hampered by the worldwide shortage of shipping brought on by the war. He retired in 1947. 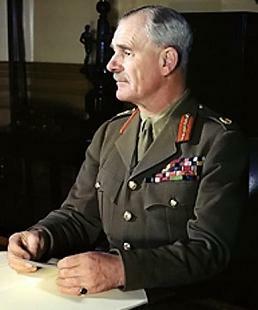 Wavell was regarded by his peers as an excellent general, able to accomplish a great deal with limited resources. However, his talents often went unrecognized, perhaps because of his taciturn nature. Nor was he at his best as commander of ABDA, where he consistently underestimated the Japanese and vainly tried to contest every foot of ground with a vastly superior opponent. This culminated with Wavell completely losing his temper in a meeting with Hutton on 28 February 1942 in which he accused his hapless former chief of staff of having a defeatist attitude. He was equally petty in his treatment of Smyth, who he not only ordered relieved of his command, but stripped of general rank and forced into retirement. Wavell was made Viceroy of India in September 1943, just as the terrible famine in Bengal was reaching its peak. Wavell acted vigorously to bring the famine under control, instituting price controls and persuading the British military leadership to divert 25 cargo ships from military cargoes to bring in 200,000 tons of grain. Wavell was a skilled writer of both military history and poetry, but inarticulate in conversation. Rommel is said to have carried his Generals and Generalship with him during the desert war.